Hi, I am interested in your 1981 Jeep CJ 5 (stock #1325-NSH) listed on Autotrader for $18,995. I'd like to get more information about this vehicle and confirm its availability. These short-wheelbase CJ5s are a blast to drive. Their maneuverability and light weight make them very desirable for off road use but also fun to sport around town in. It opens up new parking possibilities where lesser vehicles dare not tread, letting you get closer to the action. Check it out. This little Jeep looks like a party waiting to happen. A fresh coat of paint has been expertly applied in a gorgeous shade of Blue and it shines as bright as a summer day. The soft half doors and bikini top would grab peoples attention as you roll into town, a festival, or down to the lake. Its aggressive stance doesnt just come from those 33X12.50s, there is a bit of lift to the chassis too. Those alloy wheels do fill up the fenders nicely, complement the lift perfectly, and you can even show them off with the LED lights mounted up in the fender wells. Up front the iconic 7-slot grill that has been on every Jeep since WWII is underlined by a sharp looking chrome bumper, while out back a full-sized spare is mounted on a Rugged Ridge carrier with a hitch receiver and D-rings in the bumper below it. Open that soft half door and climb on up into the Rugged Ridge high back bucket seats that are nestled safely between the bars of a padded roll cage. In front of you is a steering wheel that is thickly padded mounted on a chrome 3-spoke hub and tilt column. Behind it is a Black diamond plate dash that looks as tough as the rest of the truck. The gauges are crisp, clean and easy to read with the speedometer containing the fuel and temp gauge while voltage and oil pressure gauges are mounted off to the right. A Kenwood FM/CD/iPOD compatible sound system cranks out the tunes for your listening pleasure and billet shift knobs top the shifters for the manual transmission and transfer case. There is a chrome grab handle for the passenger and mounted up high over the rear-view mirror is an inclinometer so you can see how exactly how far you pitched or rolled during that epic adventure you had. Complimenting the awesome outside and inside of this Jeep are chassis and running gear that have received as much attention and love as they have. Under the hood you will find the tried and true 258 cubic inch in-line 6-cylinder engine. It has been serviced up with plenty of new parts like a fresh valve cover and oil pan gaskets, new ignition components, belts, hoses, and an upgraded aluminum radiator. The exhaust flows out through dual free flow mufflers that give this CJ are gnarly growl. Power flows back through a new clutch, throw out bearing and resurfaced flywheel to the 4-speed manual gearbox and transfer case, to a Dana 30 front axle and Dana 35 rear that have been serviced up too with new axle seals. If you are heading out for some rock crawling fun, pull the pins on the sway bar for some extra travel and articulation. You might even want to keep an eye on that inclinometer to see how radical you actually got. 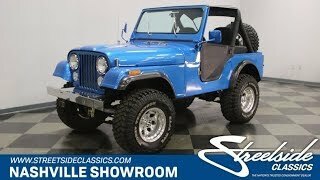 This is a super solid CJ that looks great and drives out well. Come on down and check it out. Then start thinking about where you are going to go with it. Your options are pretty wide open.